After another long deployment, “1/6 HARD” is coming home. First Battalion, 6th Marines, out of Camp Lejeune, N.C., will return to the U.S. soon, according to a Marine Corps news release published today. The Corps has been flying forces from Lejeune’s 1st Battalion, 8th Marines, to replace them in combat, the service acknowledged earlier this week. It has been a whirlwind few years for 1/6’s Marines, some of whom pushed through major offensive on three consecutive deployments. In 2008, 1/6 served as ground combat element of the Lejeune’s 24th Marine Expeditionary Unit as it kicked in the door in Afghanistan, putting a conventional Marine battalion on the ground there for the first time in three years. 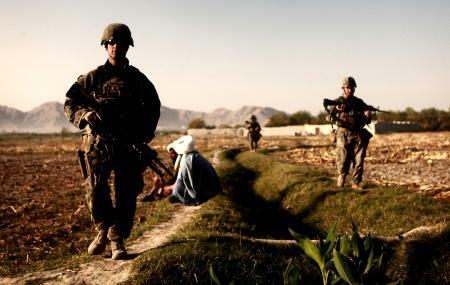 Marines 1/6 assaulted Garmser district at a time when most of Helmand province was overrun by the Taliban. That brings us to this deployment. We’ve covered some of 1/6’s operations on this blog, particularly Operation Eastern Storm, an assault in October aimed at taming portions of Kajaki district in northern Helmand. That effort was led by the unit’s Bravo and Weapons companies. Its Marines stayed in the region after the assault, facing combat like this firefight captured on video. The unit wasn’t just in Kajaki, however. Charlie Company 1/6 deployed to Marjah again, reinforcing sections of the district that still had Taliban resistance. Alpha Company deployed to volatile Sangin district, where it supported 3rd Reconnaissance Battalion and, later, 1st Recon. 1/6 24th MEU was in Garmsir in 2008 not 2009. I remember because I was in Iraq at the time and it was a big deal when 24th MEU went out of the wire. 2/7 was also conducting combat ops at the time. That’s an oversight on my part. We’ve written about the MEU deployment at length, and it obviously kicked off in spring 2008. I’ve updated the entry.